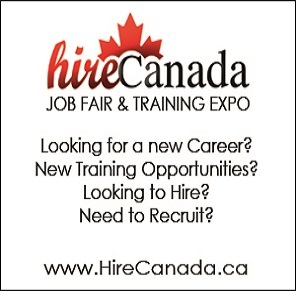 Hire Canada invites your organization to exhibit at their upcoming Job Fair and Training Expo! Our recruiting events draw thousands of individuals from all levels, qualified and skilled, who are seeking new jobs, careers, and interested in upgrading their skills. Meet face to face with talented candidates. Schools, colleges and private institutions who attend can take advantage of the large number of individuals who are interested in upgrading their skills. A great place to network with the hidden job market. 8’X8′ booth space enclosed with pipe and drape style dividers. (Larger booth spaces are available. Please contact them directly for various pricing options).